Posted on July 24, 2017 by Barry V.
It’s cold and very windy on the morning I arrive at the Blue Hills Trailside Museum in Milton. 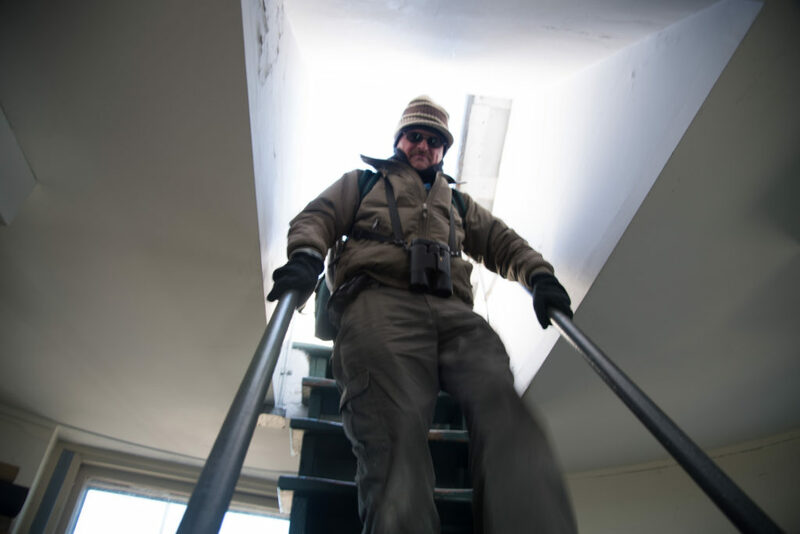 Mass Audubon runs and manages the Trailside Museum, the visitor/interpretive center for the Blue Hills Reservation. This 7,000 acres public reserve is the largest open space within 35 miles of Boston, and is owned by the Massachusetts Department of Conservation and Recreation (DCR). I figured winter would be a good time to visit the Trailside Museum, since it would offer opportunities for both outdoor and indoor work. The Trailside Museum is only minutes from the Museum of American Bird Art in Canton – the sponsor of my residency. I’ll stay overnight in MABA’s guest suite and spend two days at Trailside. Sean Kent, the education director at MABA joins me both days (thanks, Sean for your photos in this blog entry!). 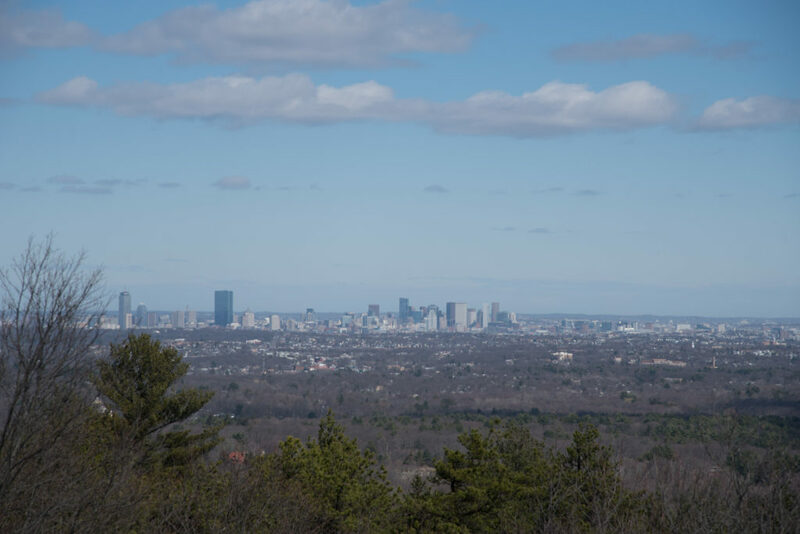 Today, March 2, Sean and I hike to the top of Great Blue Hill (elev. 635 ft.) and take in the view of Boston and the Harbor Islands. 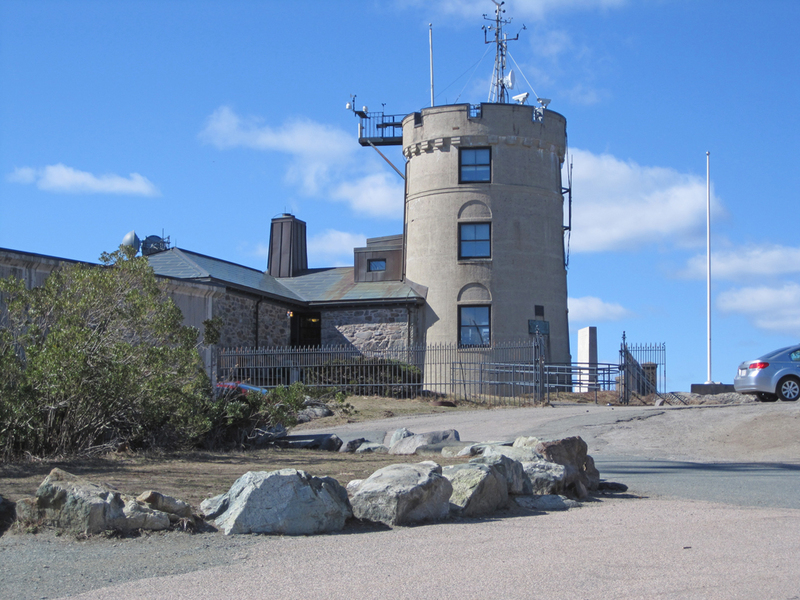 While at the summit, we visit the Blue Hill Weather Observatory – the oldest continuously operated weather observatory in the United States. 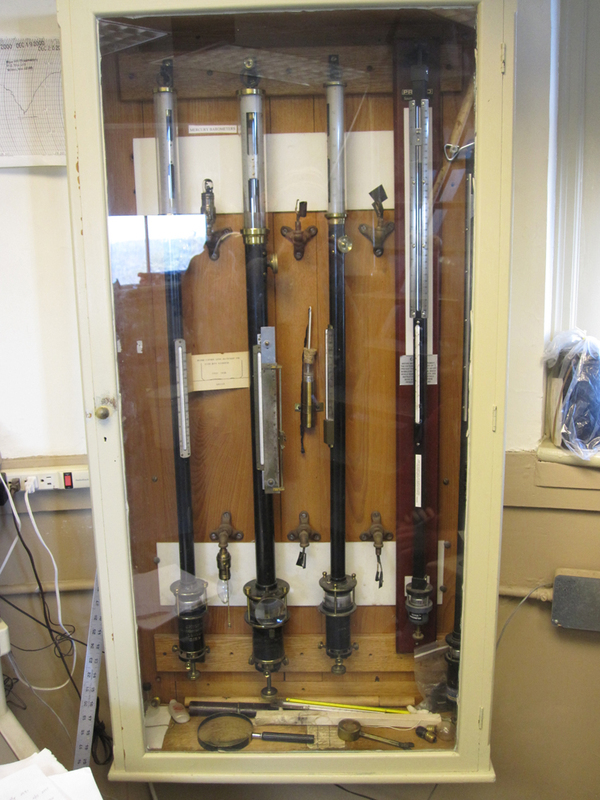 Below, in the control room, a technician points out a glass case of antique mercury barometers – still working and very accurate! Down off the summit, and out of the wind, we set up to do some landscape work featuring the rocky outcrops along the Summit Trail. The temperatures have been dropping throughout the day, and it’s in the low 40s when I begin drawing. I’ve brought along a few of those chemical hand-warmers, and slip one into the glove of my drawing hand. I can’t draw with the glove on, but I slip it on and warm up my fingers periodically. Here’s the painting about half finished. You can see that I laid in the tones of the distant background first – I’ll want them to recede in the finished painting, so deliberately make the colors pale and subdued. 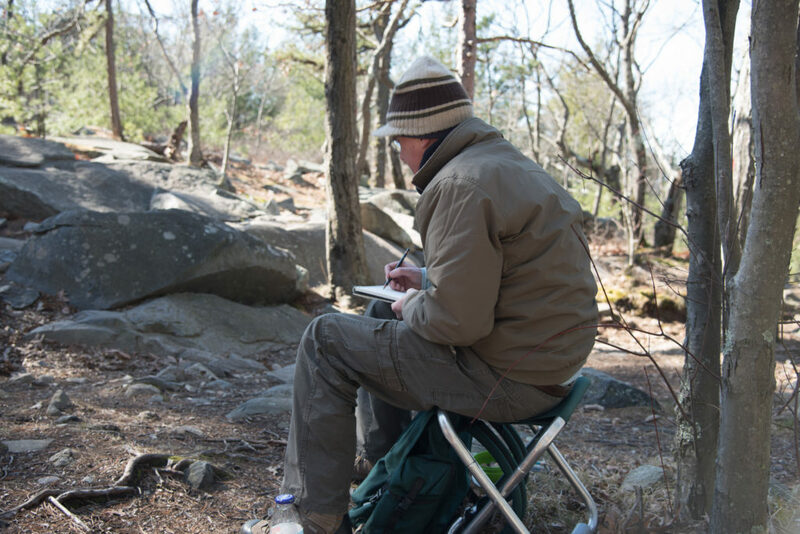 Next, I paint the areas of ground between the rocks with a rusty brown tone, which at the same time organizes the shapes of the rocks. 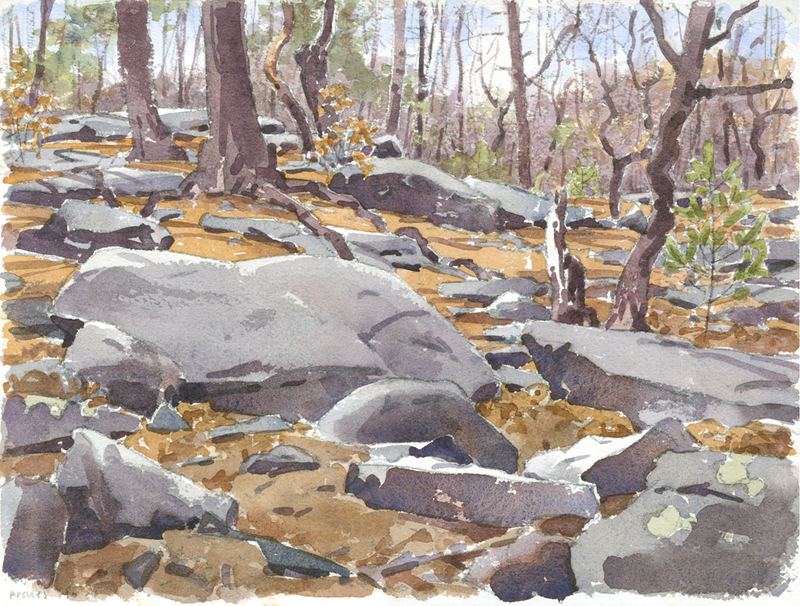 Then, I paint the shadow pattern of the rocks and lay in the darker tone of the three dominant tree trunks. The shadows on the foreground rocks are among the darkest notes in the painting, so I’ve now established the full range of values. 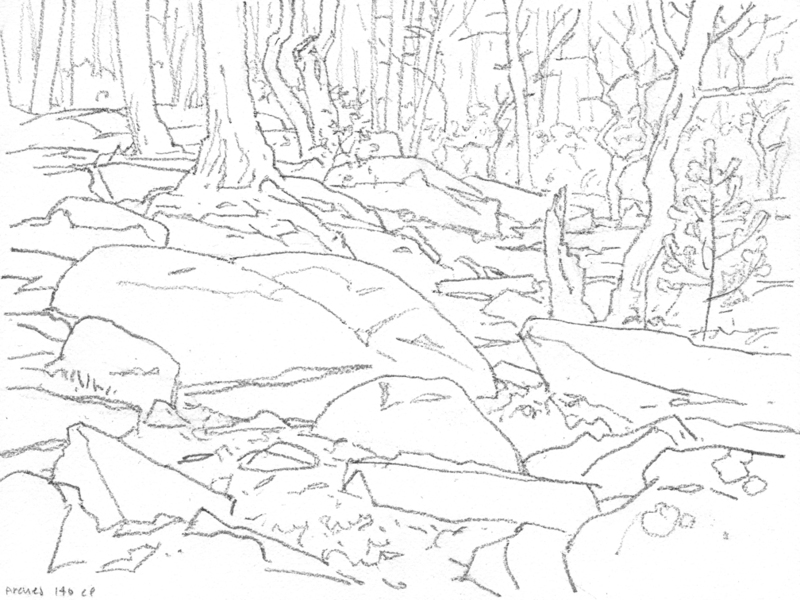 Now, it’s just a matter of laying in the middle value grays of the rocks. I try to add some interest and variety here, by varying the complements used to mix the grays. Most of them are mixed from ultramarine blue and cadmium orange, but I also throw in some burnt sienna and cobalt violet here and there. 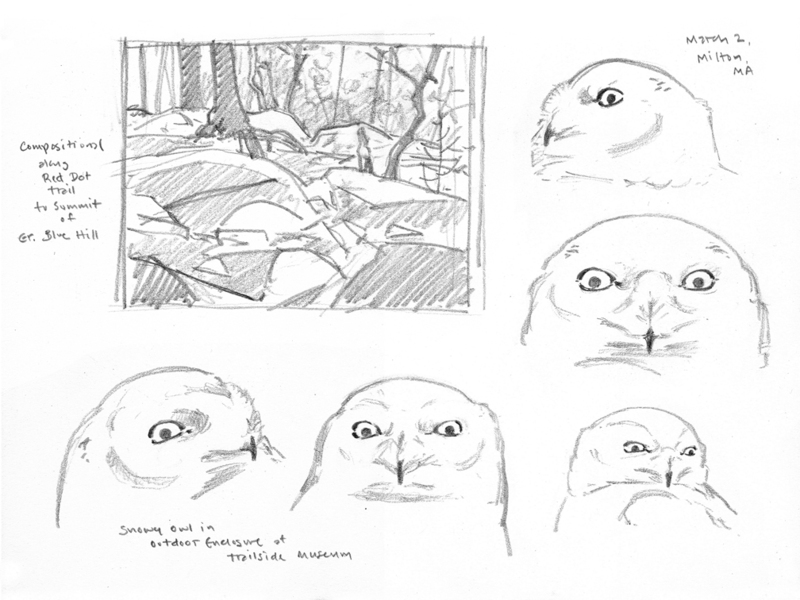 Back at the Trailside Museum that afternoon, Sean and I make some drawings of the snowy owls in one of the outdoor pens. 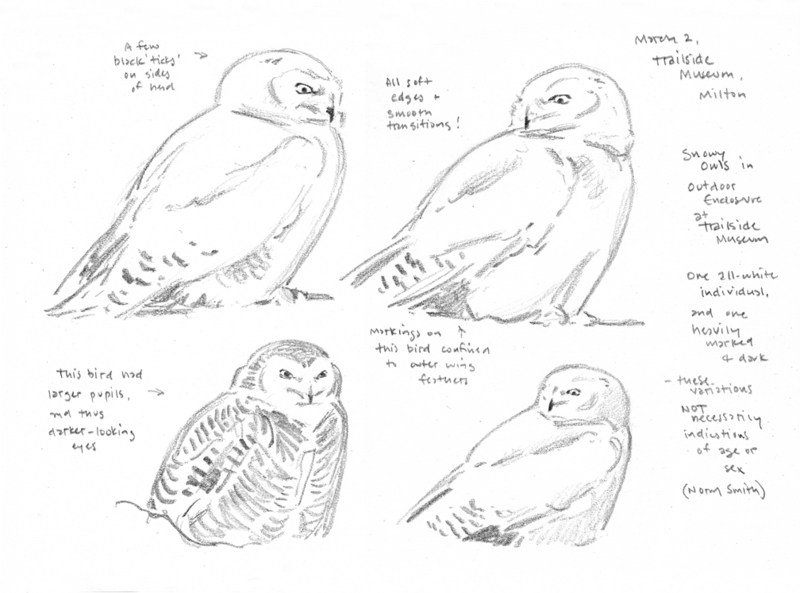 The birds are sitting on the ground in the rear corner of the enclosure, but with my telescope, I have “in-your-face” views of the bird’s heads and do several pages of studies. There are two owls: one almost completely white with only a few scattered markings on the wings and tail, and the other heavily spotted and barred all-over. 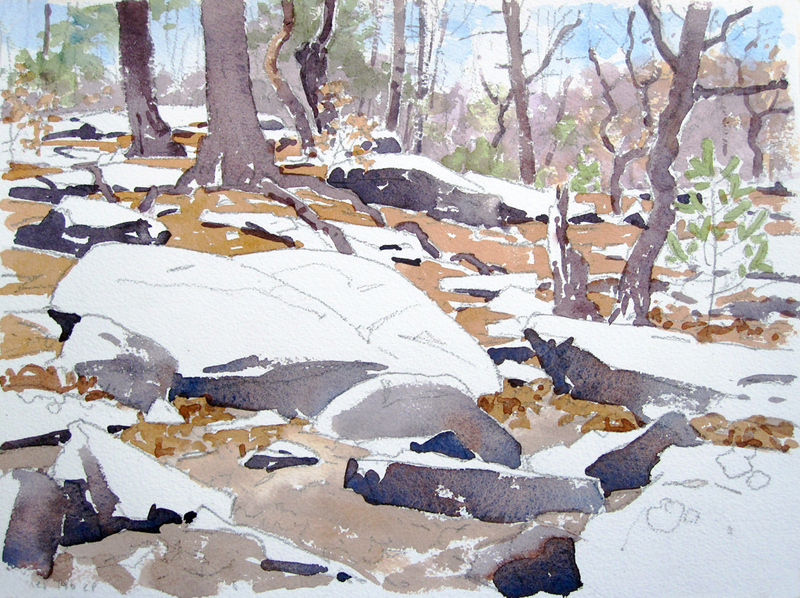 This entry was posted in Artists, Barry Van Dusen Residency, News and tagged Barry with gloves, Blue Hills, Cold, Landscape, Snowy Owl, Talus, Watercolor, Weather, Working Watercolor on July 24, 2017 by Barry V..